This is a survey of other 20th and 21st century unequal temperaments that have had the name "Bach" attached to them, as theoretical reconstructions of J S Bach's preferences. As explained at pp165-6 of Le temperament musical by Dominique Devie, Herbert Kelletat in 1960 started the speculation about Bach's temperament(s) with the book Zur musikalischen Temperatur, I. Johann Sebastian Bach und seine Zeit. In making his own formulation of a temperament, Kelletat gave strong credence to Bach's pupil Kirnberger. As a blend of Werckmeister III and "Kirnberger 3", this Kelletat layout put regular 1/4 PC fifths into C-G-D-A. To avoid having the C-E major third smaller than pure, the A-E is slightly less tempered (i.e. only 1/6 PC) and the remaining 1/12 (essentially a schisma) is placed into C-F.
Herbert Kellner in the 1970s, and then in a long string of articles for the rest of his life, promoted a temperament of his own devising based on the premise that Andreas Werckmeister concealed his best solution (and the premises that somehow Bach must have known about it, and that spiritualized numerology is a valid method to prove/explain all this...). John Barnes's 1979 article in Early Music, "Bach's Keyboard Temperament: Internal Evidence from the Well-tempered clavier", presented this temperament purporting to be derived from a statistical analysis of Bach's major-key preludes in both books of WTC. Its pattern is similar to that of Kellner's (and Werckmeister III before it), but shaving the PC by 1/6 comma rather than 1/5 or 1/4. The additional piece of tempering is given to the fifth F-C.
Claudio di Veroli, in 1981 response to this Barnes article, suggested the use of the popular "Vallotti" temperament (which happens to be identical with this Barnes temperament on 11 of the 12 notes, but with a slightly lower B). An informal reproduction of Barnes's analysis in summer 2004 [Bradley Lehman, unpublished], running his experimental data on 40 other temperaments and similarly plotting the results, reveals that Barnes's experiment strongly favors any temperaments that begin with F-C-G-D-A evenly tempered, as opposed to beginning with C-G-D-A-E... For example, the simple 1/5 PC temperament F-C-G-D-A-E (with all other fifths being pure) does even better at Barnes's own premises than Barnes's temperament does. Barnes's article, in its footnote 20, also presented an earlier Barnes formulation from 1971: a layout having 5ths Eb-Bb-F and F#-C#-G# pure, and all the others tempered by 1/8 PC each. Barnes's claim here was that his statistical study caused him to abandon that in favor of his main one. I've been reading Claudio's new book, and am about 1/5 of the way through it so far (but skipping around). I'll reserve review until I've read the whole thing. - As his printed excerpt from C major book 2 shows, alongside his tables of prelude data: Barnes disregarded major 10ths and 17ths. He counted ONLY major 3rds in their close position, and not in inversion as minor 6ths, either. The F# major prelude of book 1 therefore has 0 (zero!!) data points, the C# major has only two, book 2's G major only six, and book two's F# major only ten. Book 1's G and D major bring up only five and seven data points, respectively. Barnes rationalized this away by observing that the musical texture in those pieces happens not to fit his choice of methods. Well, yeah. What about those listeners who find some far-out-of-tune major 10ths or 17ths to be MORE objectionable than the corresponding 3rds? As these thinly-textured preludes show, along with the Inventions and the four Duetti, wide spacing of two voices can lay out any tuning problems naked to the world. (A 15-minute play through the Duetti is a great way to find infelicities in temperaments....) But Barnes's experimental method reveals only the truism that Bach happened to compose thicker-texture music in the WTC preludes that generated lots of data points. Those thicker pieces overwhelm the experiment, at the expense of pieces in wide-open texture, just because they have closer spacings, more notes, and therefore more major 3rds. - Barnes's classification of major 3rds into five "prominence categories" is understandable, but it's also subjective...and it will shift somewhat, when the music is played on instruments of different tonal qualities. Other factors such as tempo, articulation, phrasing, and registration would also come into play, here. - Why should we expect Bach, or any other systematically-oriented composer (Chopin's or Shostakovich's 24 preludes as a gold mine of temperament data, anyone? ), to have featured any specific major 3rds ahead of any others...ONLY because of their relative qualities of consonance? This assumption reduces the compositional process to a numbers game. Taking this to its absurd extreme, the preponderance of C-E in Terry Riley's "In C" doesn't prove that it should be played in any specific temperament. - IF we were to take Barnes's experiment on the major-key preludes as meaningful, then he and di Veroli have both missed a temperament that fits Barnes's data even more simply than his own. I reproduced his experiment several years ago, inputting all his data from this 1979 article, and noticed that the most elegant fit is 1/5 PC F-C-G-D-A-E, with pure 5ths everywhere else. It doesn't sound especially good in the music (pardon the value judgment), but it fits Barnes's thin data better than his own layout does, and by Occam's Razor it should win. Still, all this is an aside...because the experiment itself delivers meaningless results about tuning. - IF we must be fixated on the relative qualities of tempered major 3rds, then minor 6ths also deserve more attention than they get. 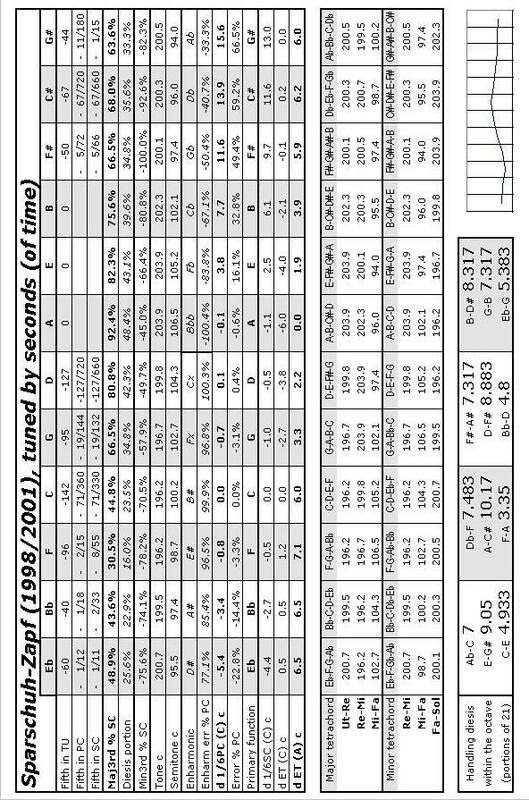 Other intervals come into play beyond the 8:5. For example, try playing in regular 1/6 comma (which, according to Claudio's book, has no advantages: "In a nutshell, this is a temperament that manages to put together all the worst features of both Standard Meantone and Equal Temperament, but none of their virtues."...). In this temperament, the augmented 5ths C-G#, Eb-B, F-C#, and Bb-F# are each very close to a pure 11:7. They sound startlingly consonant, given an expectation from the misspelling that they should be awful as minor 6ths. That is: playing continuo or other heavily triadic music in regular 1/6, one can get away with playing B major, C# major, and F# major in first inversion, even though they "shouldn't" work according to superficial analysis of major 3rds. Barnes's article doesn't go there...or into any of the other interesting intervals that populate real music. My most extensive argument against the Barnes temperament is in my 2010 article reviewing a book by Claudio di Veroli. The article starts on page 25 of that PDF file, or page 137 of the journal's numbering. The Barnes section starts on page 42/154. It goes through all the above points, and much more, showing that the Barnes method is meaningless. Bernhard Billeter in his book Anweisung zum Stimmen von Tasteninstrumenten in verschiedenen Temperaturen (Merseburger, 1979), pp30-31 and in his Anhang, presented a conjectural temperament of his own. In structure its pattern resembles "Kirnberger 2" with most of the tempering going into the fifths D-A-E. Billeter tied his layout back to his conjectures about a Gottfried Silbermann temperament, presented in this same book. 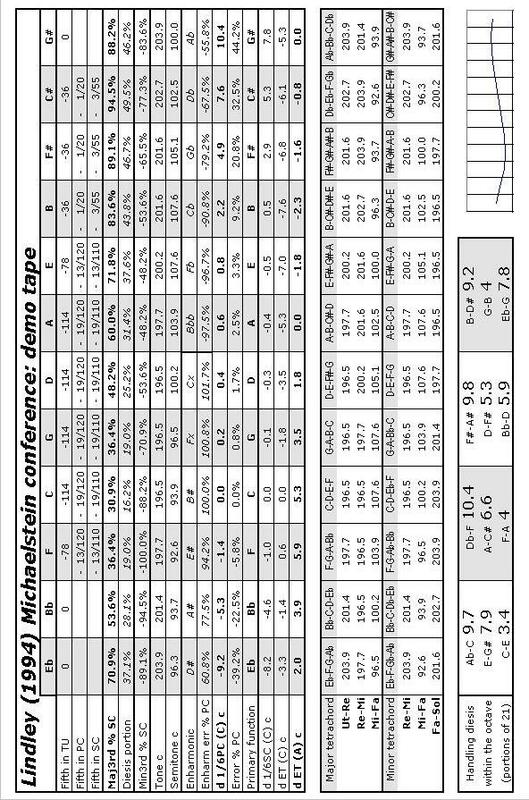 Instead of Kirnberger's 1/2 SC into D-A-E each, Billeter used 1/3 SC. The remainder is spread among the fifths on either side: F-C-G-D and E-B-F#. Ab 0 Eb 0 Bb 0 F -2 C -2 G -2 D -7 A -7 E -2 B -2 F# 0 C# 0 G#. Eb-G 9, G-B 2, B-D# 10. His 5ths are variously pure, or tempered by 0.6, 1.3, or 1.9 units. 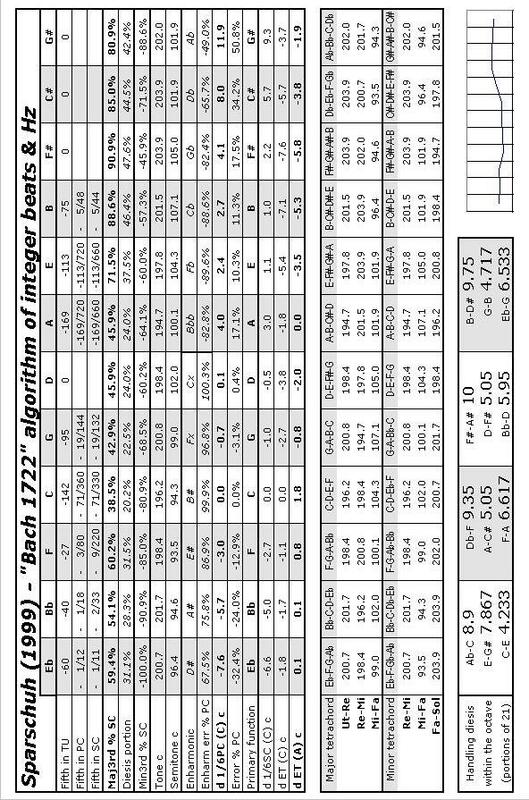 I have reproduced the same layout here with my standard analysis program (correcting one obvious misprint at his A#-E# 5th), allowing for different round-off errors between our two computer programs based on 5ths...and the results agree within 0.1 unit. The layout is indeed very good musically, and I have used it on my harpsichords several times in 2005-7 to play through Bach repertoire as a test. Especially, I have played through the fourteen Bach compositions that Lindley reports were used on his tape: BWV 541, 582, 552, 622, 654, 671, 714, 727, 687, 721, 689, 1114, 540, 732. I also recorded some of these on the organ in my own CD set. Having explored these compostions in this way, I believe that some of Lindley's musical commentary about his tape (pages 50-51 of the article) forces his own premises about the Ab and Db being relatively low in their harmonic and melodic contexts. I noted this point also as part of my argument in "Bach's extraordinary temperament." Lindley's expectation that Db-F must be the widest major 3rd is not placed convincingly onto the desk and instruments of Johann Sebastian Bach. Rather, it is loosely circumstantial, and it comes from implications drawn from other temperaments that Bach would not necessarily have favored. As for my assessment "unworkable" with such layouts that have an extremely wide Db-F, I have explained my reasoning in part 2, and again in the Clavichord International article: the fundamental problem is the treatment of enharmonic respellings, and especially in the notes Db/C# and Ab/G#. There are no outrageously bad intervals anywhere, but in my opinion this layout is so mild that the balance of inequality starts to become moot. All twelve 5ths are tempered (varying from 0.5 to 2 units), and ten of the twelve major 3rds are within 2 units of equal temperament's average size of 7. The widest major 3rd is still centered around Db-F...which goes back to Lindley's own premise in figure 1 of this article! He admitted as much on the bottom of page 57, that the premise is his own preference: "Perhaps I should emphasize that it is from our musical experience, and not from any abstract consideration, that we learn that Ab-C (involving the third flat in a key-signature of flats) should be tempered more than E-G# (involving the third sharp in a key-signature of sharps)." Well, it is just this sort of abstract consideration that I have presented in my articles, showing why a relatively large E-G# makes logical sense in music. If we consider the C major scale the center of tonality--an axiom with which Lindley and I and 18th century theorists agree--, the note Ab is more closely related to the home base C than G# is. Ab is only four positions around the circle of 5ths (C-F-Bb-Eb-Ab), while G# is eight positions from C in the other direction (C-G-D-A-E-B-F#-C#-G#). Therefore, tonal music sounds smoother when Ab-C is smaller than E-G#; or, at limit, that these two are the same size! 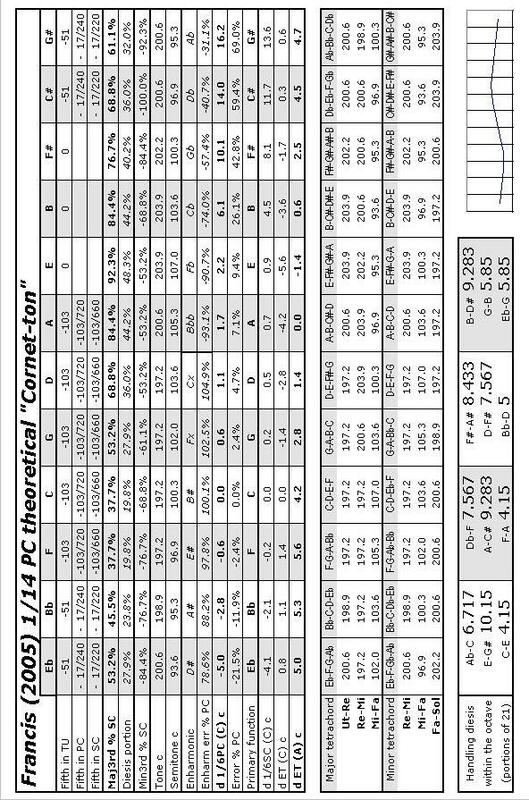 But, Lindley's formulations consistently place Ab-C wider than E-G#. Once again, let us consider the body of Bach's extant music for harpsichord and organ as evidence: set up these temperaments, play the music where problems most readily show up, and then re-examine Lindley's premises from the first six pages of this article (and elsewhere). Even one of Bach's most extreme examples--the six-part ricercar from the Musical Offering, cited by Lindley in a 1985 article as especially problematic--becomes non-problematic in practice when Ab-C is allowed to be slightly smaller than E-G#, and with the nearby intervals balanced accordingly. This works only in the following notes on the keyboard, in these specific registers: 1 beat each in the 5ths proceeding from bass A-tenor e, e-b, and b-f#'. 1 beat each in the 5ths proceeding from tenor c-g and g-d'. 1 beat each in the 5ths proceeding from eb' (above middle C)-bb', bb'-f'', f''-c''' (top of the keyboard). The other 5ths are pure on all D-A intervals and F#-C#-G#-D# intervals. The one-beat intervals naturally have halved beat rates at the octave below, and doubled beat rates at the octave above, as everything doubles at each octave (this is a general principle of all temperaments, since all octaves are pure 2:1 ratios and all frequencies therefore double). Presuming that we are using a clock or a pendulum to set any of this up by ear, our bearing section on the harpsichord therefore goes from bass A (slightly more than one octave below middle C) up to the C two octaves above middle C, setting eight specific 5ths to have one beat each. The fundamental problem in this, at a theoretical/technical level and in musical practice, is that expectation that the counting of beat-rates by seconds (in arbitrary placements on the keyboard at arbitrary pitch!) is somehow meaningful, more than commas would be, to Bach or any other 18th-century musicians; and the Sparschuh formulation works only at the specific pitch level where A=420 Hz and C=500 Hz. Why would Bach be interested to calculate anything on paper, or to lock himself into a single pitch standard? What would he do if a visiting friend came in to try out a new oboe with his harpsichord, at something other than A=420? And if Bach had been interested in paper calculations by frequencies and/or string lengths, why would he write it down in such an arcane manner instead of with numbers? Secondarily, Sparschuh's premise (and resulting temperament) gives nine different sizes of fifths, to force these arithmetical counts of beats: this degree of irregularity being anathema to the accompaniment of other instruments. The A-E 5th is tempered more tightly than 1/4 syntonic comma; C-G is approximately 1/5 comma; E-B approximately 1/6; G-D approximately 1/8; four others gradually less; and finally, four pure 5ths. From a perspective of string and wind players, expecting some regularity within the scales geometrically rather than arithmetically, the notes on the keyboard here are in well-nigh random positions. (A good resource about regular scales is Easley Blackwood's book The Structure of Recognizable Diatonic Tunings, Princeton 1985.) For example, a violist who copied open strings from the keyboard would find that the c-g 5th is more strongly tempered (more noticeably sour) than g-d', and d'-a' is pure. A violinist would find that the open a'-e'' is the most strongly tempered of all...and it's next to the pure d'-a' 5th in the middle of the instrument! How is this string player to play anything in tune, either harmonically or melodically, with or without the keyboard's assistance, given the severe handicap of three different sizes of 5ths on the open strings? And why would Bach--a very good string player himself--offer such a system as a standard on any instrument, keyboard or otherwise? As of October 2005 (letter to me from Dr Sparschuh), a book is forthcoming where Sparschuh will explain more fully his mathematical-algorithm theory and its possible relevance to Bach. 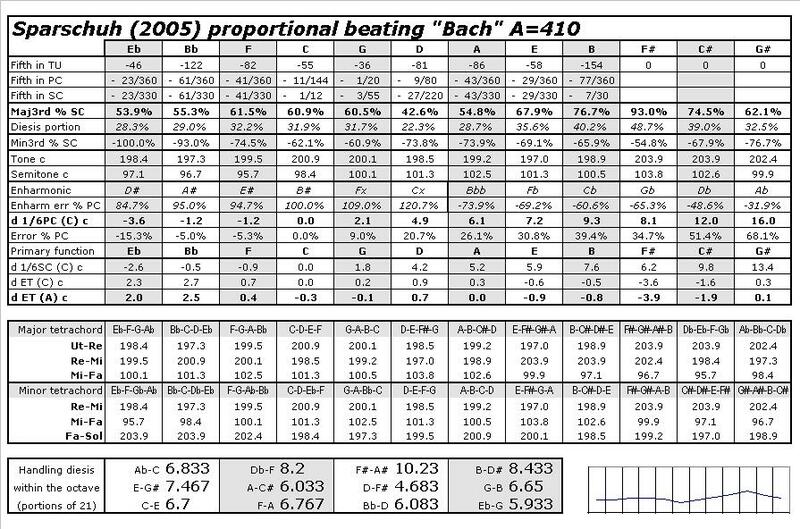 11/17/05 Dr Sparschuh sent me a note complaining about the round-off errors in some of the beat rates of the above chart, where not everything ends in exactly .00 as they should (or .50 at some lower intervals). He cited this in an accusation that my calculations and my software are therefore not accurate enough for reliable work in this field, that my methods allegedly use too many approximations, etc, etc! He is correct that the beat rates should end with exactly 00 after the decimal, and I'm sorry. Obviously they should do that, for the mathematical model to be exactly right, because all the frequencies are integers in Hz and that is a point of his algorithm. But in the bigger picture of reality here: (1) who in listening to music can honestly perceive any difference of 1/100 of a second in a beat rate, and (2) what acoustic instruments will ever stay that exactly in tune--presuming that they could even be put into such a tight constraint--for more than a few minutes? And (3): keyboard tuning in practice is not merely about sets of numerical calculations! I would say that it is not even primarily about a numerical anything. 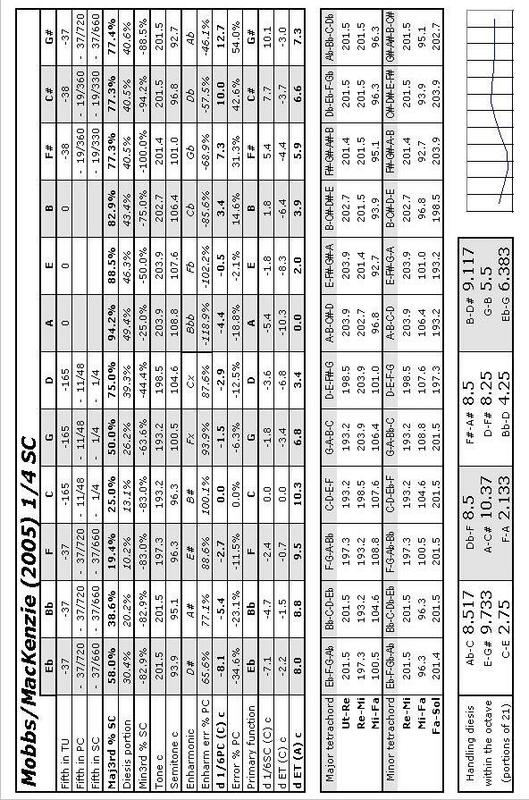 See also his new 2005-7 formulations, below. Martin Jira's book, Musikalische Temperaturen und Musikalischer Satz in der Klaviermusik von J. S. Bach (2000, Hans Schneider - Tutzing), presents two experimental temperaments ("Arbeitstemperaturen") of his own devising. Both of them are based on a core of 1/6 comma tempering at C-G-D-A-E, pure 5ths at C-F and E-B, and then variously tempering the five accidentals to complete the circle. These are presented at pages 37-41 of his book, following sections that describe the basic principles and historical setting. Jira's "Open" temperament ("offene Arbeitstemperatur") allows one wider-than-pure 5th (technically a diminished 6th) at the same place it would normally be in meantone-based systems: between G# and Eb. The gap is the mild amount of 706 cents, or 1/6 comma wider than a pure 5th, which is the same size as some of the intervals in Werckmeister's temperaments. Jira's "Closed" temperament ("geschlossene Arbeitstemperatur") then tightens up that gap so no intervals remain at wider than a pure 5th (702 cents). "Open" temperaments have a wider range of expressive variety among the keys, with greater variation of size among the major 3rds, minor 3rds, and leading tones. His 706-cent interval is not wide enough to make an objectionable sound when played as a 5th, making any noticeable "wolf". In quality it merely sounds about the same as a 1/6 comma narrow 5th, i.e. 698 cents, as found elsewhere within the same temperament. He discusses how both these types were considered good ("Gute") temperament styles by various German writers, with or without any widened 5ths ("überschwebende Quinten"). Refreshingly, he avoids the modern red herring that "well temperaments" must by definition have no slightly-wide 5ths in them. That concept is a trap that snares some other writers, absolutely refusing to consider any "überschwebende Quinten" as valid in Bach. 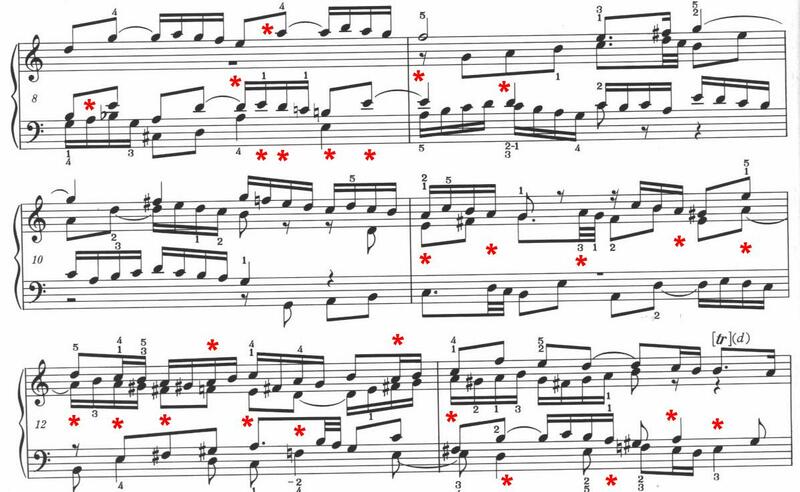 The rest of Jira's book then goes through the entire Bach keyboard repertoire, showing how the compositions interact with these two strategies of "Open" or "Closed" intonation. It describes the basic enharmonic problems for the notes used in each piece, and the different requirements of harmonic considerations vs melodic considerations such as high leading tones. In Jira's opinion, some of Bach's music works better in the "Open" type of temperament (considering that the gap is where he put it! ), and some of it in the "Closed" type. A CD of musical examples is included with the book, demonstrating these two temperaments on a harpsichord. A reasonable revision of Sparschuh's work was by Michael Zapf, informally proposing in 2001 the layout shown here. By breaking octaves back arbitrarily to stay in a central area of the keyboard, one can tune fifths either ascending or descending that have the desired pattern of beat-rates: 11100022222, allegedly as indicated by Bach's drawing. The fifths with "1" beat once per second, at a specific octave and pitch level. The fifths with "2" beat once per two seconds, likewise; and the fifths with "0" are pure. Zapf started his line with C at the left, rather than Sparschuh's A. Overall this layout gives rather good results in practice, for solo repertoire, except that the keys of D major, A major, and E major have surprisingly high sharps in them. The most unusual feature is that A-C# is the widest major third. This is the formulation that I received in discussion with David Hitchin spring 2004: ten sizes of fifths, yielding constant beat rates of 1.0 or 0.5 in the central octave of the keyboard. 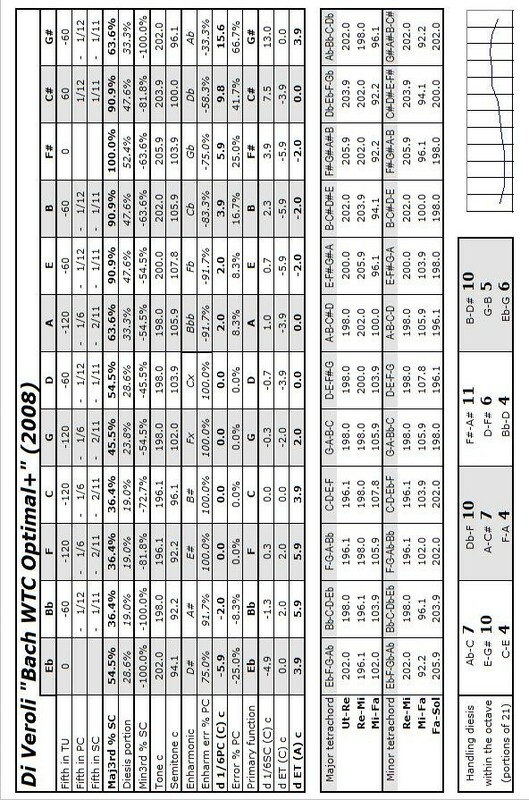 I have confirmed this set of frequencies in June 2005 with Zapf's own spreadsheet he has made available to the "Yahoo! Clavichord" discussion group; his has round-off to tenths of beats rather than hundredths (an insignificant difference in practice). And like Sparschuh's it requires a starting pitch level of C=500 Hz. As I pointed out in part 1 of the Early Music article, in and around footnote 24, my own first preferred reading of the Bach diagram (spring 2004) was as shown here: the syntonic comma interpretation, with an arbitrarily pure fifth at Bb-F. I developed this in the first draft of the article. But, discussion with Ross Duffin and Debra Nagy helped to convince me to focus on the Pythagorean comma interpretation more centrally for all the later rounds of the work. I agree with them that the Bach diagram is better dealt with in that PC reading, and it all aligns better with the 18th century orchestral norm of the "55-division" as well. Accordingly, I have set aside this earlier SC version although I still tune it occasionally for fun. The resulting overall sound is hardly distinguishable from that of the other one. John Charles Francis in 2004 posted a paper at Eunomios, proposing that Bach's Preambulum (BWV 924) for Wilhelm Friedemann Bach encodes some manner of temperament in the placement of its ornament signs. From some questionable juggling of his own evidence, some unexplained steps in his moving of several notes (especially E and F#), he came up with four proposed temperaments based on distribution of 1/3 SC (but without explaining anywhere how or why he put his schisma into C-F; just a numerical leftover in his spreadsheet analyses...). Since he presented his reading "IV" as his best, including his pseudo-historical premise that the interval Ab-C should be spectacularly resonant, that Temperament IV is shown here with the same harmonic/melodic analysis as these other temperaments. Francis abandoned that line of temperament divination by esoteric signed ornamentation. Next he came out with a different line, February 2005 (posting again as an unvetted paper at Eunomios and at some other internet locations), discarding comma analysis. This time he claimed an exhaustive analysis of Andreas Sparschuh's premise (see above), presenting 144 permutations derived from Sparschuh's algorithm. 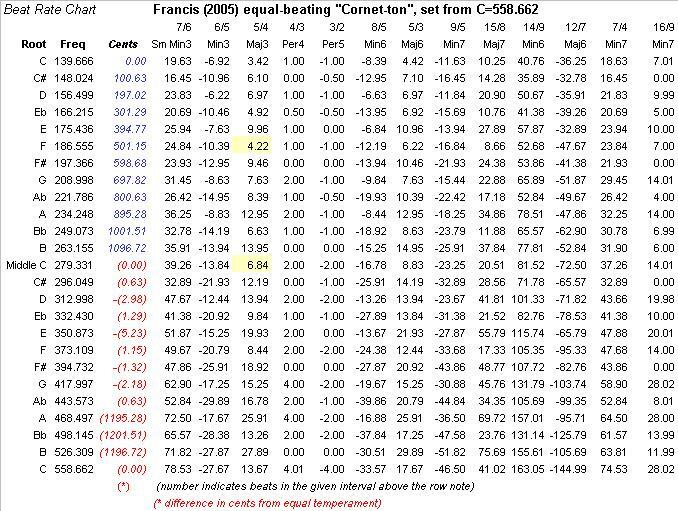 Francis's numerical analysis in February 2005 is correct, in that such patterns of beat-rates can be discovered (i.e. forced to look important) with enough number-crunching in computer spreadsheets, and with a careful choice of starting pitch and octave displacements. So? The paper does not explain why any of this is particularly relevant to Bach's music, other than offering a table superficially surveying Bach's key signatures. This is all just another (and different) promotion of esoteric mathematical observations, dressed up to appear scientific on the surface...and using as few credited musicological resources as possible, from the standard tuning literature. And the underlying premise of integer beat-rates remains problematic. In response to the February half of my Early Music article, Daniel Jencka has proposed a different handling of the 5ths C#-G#-D#-A#, tempering them slightly less (i.e. only 1/18 PC) than I proposed with 1/12 PC. This then yields the (arbitrary) pure 5th Bb-F...instead of my diminished 6th A#-F as explained here...and it changes some of the major 3rds and steps a bit, as well. 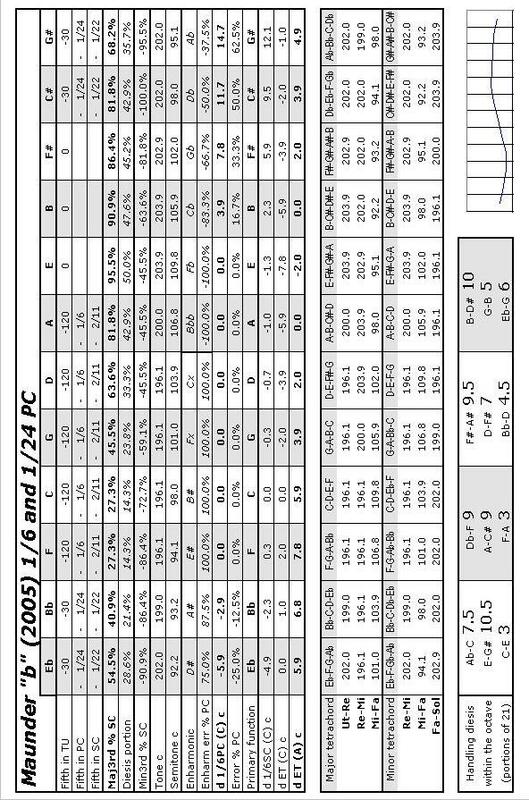 Simply put, Jencka takes the Bach pattern as 11100033333 (where 1 is 1/18 PC), instead of my 11100022222 (where 1 is 1/12 PC). He therefore raises G# and D# and A# slightly, each. In practice, of course, the sound is basically similar in harmonic balance around the circle because the difference between 1/12 and 1/18 is so small. But most notably, this layout softens Bb-D at the expense of a brighter F#-A#; similarly softens Eb-G at the expense of B-D#; and makes the already brightest E-G# even more so, for a slightly calmer Ab-C.
Jencka's introduction is also presented in his letter to Early Music (August 2005, pp545). Building from the first half of my article, Emile Jobin in May 2005 has posted a 1/4 SC reading from a different manner of interpreting Bach's diagram. Some points in his argument are based on (unfortunately) a remarkably unclear reproduction of the Bach page, leading to the interpretation that the incomplete glyph at the right side (being cut off!) is some manner of C. But, more importantly, how does the resulting layout work musically in Bach's repertoire? It is similar to other French/Italian ordinaire layouts, with the core being meantone and the fifths stretched outward gradually from B upward, and from C or F downward. As I pointed out at the FAQ page 3, this layout gives fine results in 17th century music especially; but it does not address the more adventurous keys in the WTC itself (i.e. beyond the old meantone restrictions of three or four sharps, or two or three flats). Should not a candidate for Bach's temperament, derived from the title page of the WTC, yield plausible musical results beginning with all the music in the WTC? See also "Interbartolo", below. The Jobin temperament is similar to his, when transposed by a 5th. The main focus of this third Francis paper is to press an ahistorical premise: that Bach used only a specific arbitrary pitch-level at which the beat-rates are forced to be exactly 1 or 2 per second in particular octaves. This is coupled with a pressing of Francis's "equal-beating" premise as seen in the layout below. My additional remarks about this paper are elsewhere, to save space. A public review of it by instrument-builder Paul Poletti on HPSCHD-L is also available, from 25 August 2005: concurring with my opinion that this paper is mostly a batch of frivolous creative writing and wishful pseudo-science, some attempt to mislead the unwary. 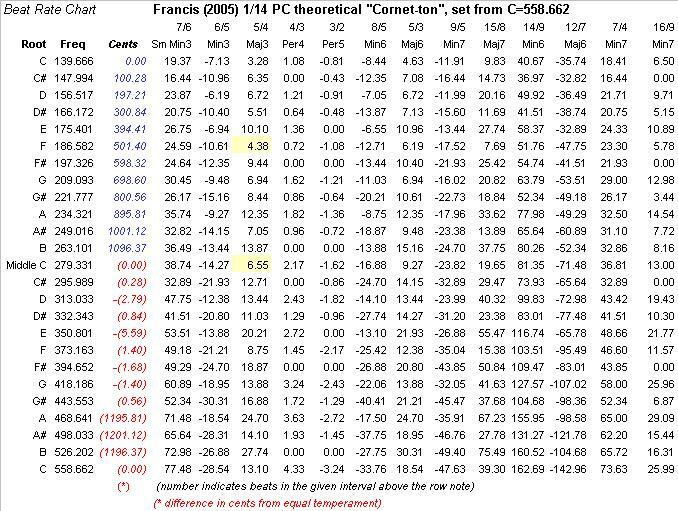 Note: in my chart of Francis's 1/14 comma layout, "-103/720" really is entered for all calculations as exactly "-1/7" of the PC. The display here is merely a round-off in the reduction to a 720-unit system. Likewise, I entered "-1/14" and it was rendered as "-17/240". My remarks about that project of his are on a separate page. His frivolous pseudo-research has already received more than enough space among the serious entries being reviewed here. Richard Maunder, in a letter to Early Music (August 2005, pp545-6) disagrees fundamentally with my placement of the note Bb, and the allowance of a slightly wide 5th at Bb-F. Others have asked about this feature, too; and accordingly I have addressed that question in June 2005 at my FAQ page 3. The note is actually an A#, it makes a diminished 6th A#-F there, and my reading of it as an A# comes directly from Bach's diagram. But evidently, some have missed that point in my explanations of this, and have misunderstood my bearing instructions on page 8 of the article (where a temporary Bb is set, only to get the Eb where it belongs). More detailed instructions by me are here with a fuller explanation of that point about temporary notes. In any event, Maunder suggests several different readings of the diagram where he disallows that "Bb-F" interval to be wide. His suggestion "a" is identical to Jencka's, see above, with double knot=1/6 and single knot=1/18 comma, and the leftover loop pure. Suggestion "c" takes the double knot=1/7 and single knot=1/14 comma, and the leftover loop also 1/14. 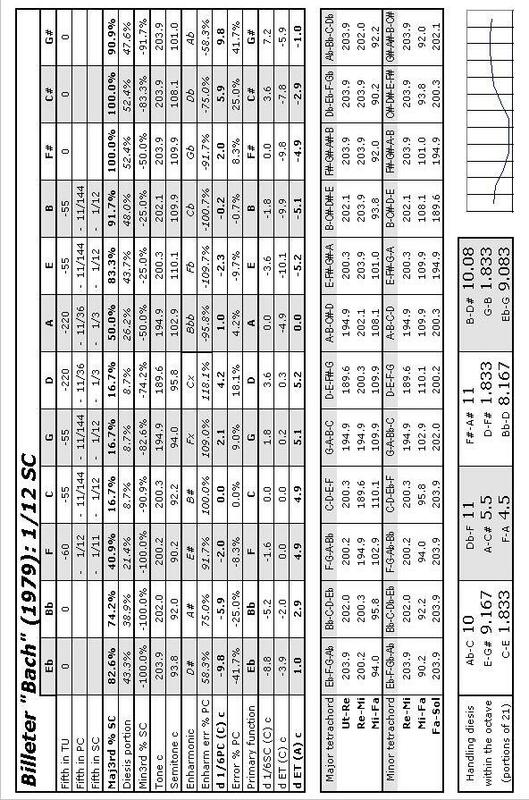 These latter two readings are shown in the following charts. Maunder remarks, "None of these differs very much from Lehman's interpretation, except in the placing of Bb; but my point is simply that Bach's diagram on its own is insufficient to define one unique temperament precisely." Indeed so, and that is why the second half of my article goes into much more detail from Bach's music and from theoretical measurements in historical context. Maunder has reacted only to the graphology portion of the article, in part 1, which is only a small part of my overall argument. Kenneth Mobbs and Alexander MacKenzie of Ord, in a letter to Early Music (August 2005, pp546-7), disagree with the step of turning Bach's diagram upside down, and they assume it must start with C at the left (why?). After presenting a comparative chart of cents values in the 5ths and major 3rds, Mobbs and MacKenzie offer the condescending paragraph: "Because of these surprisingly similar characteristics as shown above, we trust that Dr Lehman will appreciate that all his effusive enthusiasm can be transferred equally easily to this much simpler interpretation. We are sure that almost any inevitably tiny tuning discrepancies would, in practice, remain undetectable by even the most professional ear." Well, since their layout is different in both effect and balance, I invite the "most professional ear" of any reader to tune theirs for comparison, and play Bach's music in it.... The widest major 3rd is A-C#, like in Zapf's. In the December 2005 issue of Southeastern Historical Keyboard Society (SEHKS) Newsletter, Volume 26, #1, George Lucktenberg offered a short review article "Light Reading for the Winter". The first half of the article consists of informal paragraph-reviews of four other books of general interest. The second half gives a generally favorable review recommending my Early Music article, and then suggesting a practical and easy new all-purpose temperament inspired by it. "The result is remarkably smooth through all keys, while preserving the usual escalation of beats in the major thirds of keys with the most sharps and flats in the signature, and the usual 'color'-change from key to key. 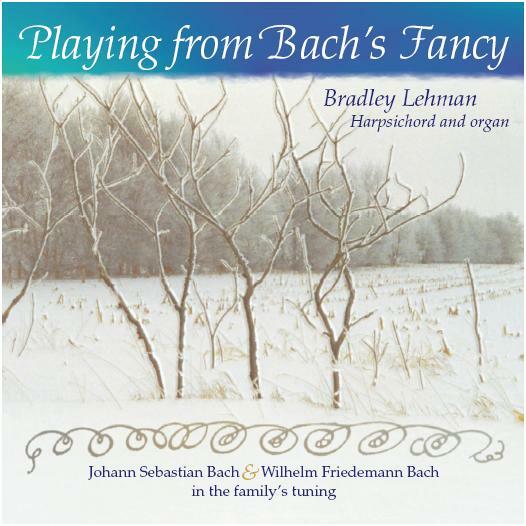 It is not exactly Lehman's ideal, but since harpsichord tunings are evanescent at best, what with vagaries of humidity and hot stage-spotlights, as a practical alternative either to meantone or equal, it is quite satisfactory for works of J. S. Bach and successors in the mid-to-late eighteenth century." (where t is 1/8 PC on average, and doing it by taste and feel rather than any rigid mathematical scheme). It is indeed very easy to do from a C fork as he suggests; and I would add, similarly easy from an A fork. [Chart] Its widest major 3rd is B-D#, and everything else is very moderate. Both of these ideas, exhibiting the alternation of pure and tempered 5ths, hearken back to the 18th century strategies of Neidhardt and Marpurg in some of their formulations. The details are in the books and articles by Barbour. I am pleased to see a well-experienced musician and pedagogue coming to these issues from the side of musical practice (his concerts, and teaching students at various levels), instead of speculation on paper. It is thinking with the tuning lever in hand, by taste and experience: the same process that I believe the best practitioners of the 18th century used in formulating their temperaments. Nudge the notes slightly, with close listening in plenty of repertoire, until the whole temperament sounds most beautiful in the music to be played. (November 2007) According to their new web site, http://www.bach1722.com, Graziano Interbartolo and Paolo Venturino in November 2005 started working with a new layout from the Bach drawing. Since June 2006 they have been doing some public performances with it, notably on an 1898 Bechstein piano. The front page of their web site gives it the grand name of "Il temperamento de Dio" (The Temperament of God). A 2007 book BACH 1722, Il temperamento di Dio: Le scoperte e i significati del "Wohltemperirte Clavier" is advertised for sale. They offer a series of short piano samples for free download, demonstrating their temperament in Bach's and other music. According to their diagram, their recipe is to use 1/4 comma 5ths F-C-G-D-A-E; pure 5ths on E-B-F#-C# and on F-Bb; and 1/12 comma 5ths wide at C#-G#-D#-A#. Does it work on instruments other than modern or nearly-modern pianos? First off, it doesn't work out mathematically at all in the way that they assert. A chain of 5ths with "-1/4" between them says to a tuner that they are attempting to build pure major 3rds on F-A and C-E when they have finished F-C-G-D-A-E with 1/4 comma tempering per 5th. And that's fine, in itself. It makes music sound very good in keys such as C major, F major, and D minor. However: having done that with the 5ths on the naturals, there isn't the amount of 3/4 of a comma remaining in the overshoot to be distributed (as their recipe asserts) with 1/12 comma wide, each! Their recipe has ignored the presence of a schisma, the difference that all temperaments must deal with in reconciling the syntonic comma against the Pythagorean comma. If they are really trying to make those three slightly-wide 5ths the same as one another, the size works out to nearly 1/19 syntonic comma, not 1/12 of either comma. And 1/19 comma is such a slight amount, it can hardly be controlled with any accuracy. If Bach had started with 1/4 comma 5ths as they say here, why would he bother trying to distribute the remaining 3/19 comma overshoot into three different 5ths, and not merely two of them (which would give him another pure 5th, and make the last averaging-out step easier as well)? The 18th century expert theorists asserted that 1/12 comma (or the size of the schisma) is the smallest practical unit for tempering a 5th. Whether it needs expert 18th century corroboration or not, it becomes obvious when working at a harpsichord and making the slightest nudges on the tuning pins, until audible beating begins in the intervals. 1/19 of a comma simply isn't practical -- and it's dismaying that the authors of this temperament can't tell the difference between a 1/12 comma wide 5th (as they prescribe) and a 1/19. I have set this up on a harpsichord and played through enough of the Well-Tempered Clavier to observe that it simply doesn't work. In this 1/4 Pythagorean comma layout, things begin to get ugly in key signatures as simple as one or two sharps (E minor and B minor), with the very high D# and A#. The G# minor prelude and fugue simply sound ludicrously bad. (Any skeptics should not merely take my word for this aesthetic judgment, but set it up themselves on a harpsichord and listen to it.) Even that G# minor fugue subject all by itself, unaccompanied, sounds poor melodically when it gets to the second half: D#-F#-G#-G#-A#-A#-D#. D major and A major are relatively central keys with only a few sharps, but the A# and E# that occur in these pieces sound much too high for their melodic and harmonic contexts. The sharpest major keys (B major, F# major, and C# major) simply sound unrelentingly harsh in this temperament, playing Bach's examples. Music in flats doesn't fare very well, either. The F minor and Bb minor compositions in Bach's book sound raucous whenever the notes Db or Gb come up. The Ab major prelude and fugue have similar problems. Is not the point to play Bach's entire book without problem? This temperament is too extreme to handle all those keys! Let's take a step back and do it with 1/4 syntonic comma, instead, and those little wide bits of approximately 1/19 comma. Does it work now? No, not really. It's milder, yes, but the problems remain in the same spots. The spread of major 3rd sizes is "only" 0 to almost 13 now, giving a wide range of color changes as the music modulates...but it's too extreme. I set this onto my harpsichord twice, to be sure, and played through Bach's book. There are too many nasty spots whenever we get into music of two or more sharps, or three or more flats. More than half of the book approaches or passes the edge of absurdity, played on harpsichord, tuned this way. The problem is not only in the major 3rds, and in the melodic motion of tones and semitones, but also more subtly in 4ths and 5ths. When the 5ths F-C-G-D-A-E are tempered by as much as 1/4 comma (either comma! ), they're noticeably nasty -- even when they're played in relatively quick passing motion in the music. F major, C major, D minor, D major, and the other simple keys can't escape this: and it's most noticeable in two-part and three-part texture. For example, the C major fugue at the end of bar 11 has D-A-E in an open spacing, and at the end of bar 22 it has C-F-G-D. The C minor fugue has problems at the downbeat of bar 9, the end of bar 14 (Bb-G-D), and the end of bar 28 (open C-G). These spots and others leapt out to my attention as I played through Bach's book in the Venturino/Interbartolo "Temperament of God". Why would Bach and/or God smudge the music with ugly intervals, or such crude effects overall? No, the problem is that this temperament is too extreme (5ths too tight, and many major 3rds too wide) for this music! And, if they are trying to respect all the readily available historical evidence: why does this temperament have two pure 5:4 major 3rds in it? I'm curious what the authors would do with the way Kirnberger was taught to tune, from lessons with Bach: that all the [major] 3rds should be wide. The old Bach Reader rendered that piece of evidence thus, with "ON BACH'S METHOD OF TUNING" on page 261: "Mr. Kirnberger has more than once told me as well as others about how the famous Joh. Seb. Bach, during the time when the former was enjoying musical instruction at the hands of the latter, confided to him the tuning of his clavier, and how that master expressly required of him that he tune all the thirds sharp." (Marpurg, 1776). It's similarly in the New Bach Reader, and it's available in German (in the Bach-Dokumente) and French (in Gilles Cantagrel's Bach en son temps) as well. The Marpurg/Kirnberger testimony here is probably reliable. But, even if it weren't, it is necessary to tune all the [major] 3rds wide/sharp anyway...because pure major 3rds leave too much error for the other two major 3rds in the octave. (For example, if C-E is so narrow that it makes a pure 5:4 major 3rd, the E-G# and the Ab-C must each be nearly Pythagorean to compensate.) One must be able to play in all 24 major and minor keys, on the instruments for which Bach wrote this music: harpsichord, clavichord, and organ. And what are this temperament's religious connections and religious effects, other than the symbolic things they have put together for 1/3 of their book, co-written with a third author named Bof? I can't address that question, not having read their book yet. The Venturino/Interbartolo temperament works better on piano than it does on harpsichord. (The extreme major 3rds sound less bright and problematic, since piano tone is weaker in overtones.) Their sound samples are decent enough. It's sort of arguable that their temperament makes pianos sound "better", or at least more interesting, than equal temperament does. And these gentlemen and any other musicians are certainly welcome to do whatever they want to on modern pianos and turn-of-the-20th-century pianos; but what has it to do with Bach and the instruments he and his students worked with? See also "Jobin", above. The Interbartolo temperament is similar to Jobin's, when transposed by a 5th. The patent for the temperament is solely to him (Interbartolo), not Venturino. Venturino's part was the numerology. Despite what their web site says, the F#-C# 5th is not really pure, and that's where the schisma is. The comma is syntonic, not the Pythagorean. 1/4 and 1/12 syntonic comma. It's not clear how the schisma is handled in his interpretation of Bach's drawing, then, as those three loops he's interpreting as E-B, B-F#, and F#-C# all look the same as one another; not two pure and one impure. But, anyway, the rest of my analysis remains as above. In this temperament the music still sounds impossibly rough (on my Flemish-styled harpsichords with mostly steel strings), for the same reasons as already mentioned. If it sounds plausible on anyone else's harpsichord, playing in all 24 keys, please send me details of the instrument's style and stringing. And with all due respect, in my opinion this resulting temperament has some even more serious anomalies and arbitrary properties than Sparschuh's first one (A=420). I do not see how anyone with 18th century tools could tune Sparschuh's methods quickly or accurately by ear, using only the Bach diagram as reference, and the resulting layout does not resemble the harmonic balance of other temperaments in Bach's milieu. Therefore, I do not wish to devote further space to these integer-games here. Please contact me for further details, if interested in my historical/musical objections to this newest layout. Dated December 14, 2005, Sparschuh has apparently created his own Yahoo! discussion group "Bach_Tunings" for any who wish to discuss temperaments derived from premises of beats-per-second. Its advertisement page gives a new hypothetical set of calculations by Sparschuh, based on a mapping to Bach's signet ring. According to its public archives through April 17th 2006, the only two members ever to post anything are Sparschuh and Charles Francis. Sparschuh's writings regularly force odd interpretations from an observation that Werckmeister and some others expressed their temperaments in terms of string lengths: as integers. He apparently does not grasp the point that monochord charts of string lengths still show only relative pitches amongst themselves; and they do not lead to any type of beat rates until the independent variable of string tension is introduced into that set of ratios. None of it had anything to do with modern measurements of resulting frequencies, in Hertz (cycles per second), because the tools didn't exist to measure the results that finely. Yet, Sparschuh continues to infer sets of frequency integers from his creative interpretations of Werckmeister's tuning strategies. Relative pitches (expressed as string lengths) turn into absolute pitches, and the results are then locked into specific frequencies...with the unsupported allegation that Werckmeister, Sauveur, Mersenne, and others also did so. See a May 17th 2006 posting by him about that.... The arithmetic calculations are pressed as if they're more important (to tuning) than listening to music. 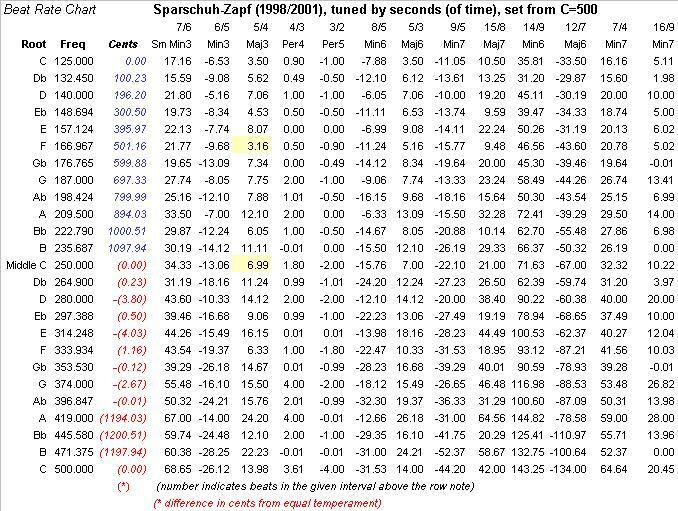 Sparschuh posted another temperament based on integer Hz on 8 September 2006 in the discussion group "Yahoo! Clavichord". Without sufficient comment to explain the derivation of his series, he posted "A tuning for the Bachhaus transposing harpsichord" as the following set of twelve pitches, based (yet again) on A=410 Hz: A 410, Bb 435, B 460, C 488, C# 517.5 (1035), D 548, Eb 580, E 614, F 652, F# 690, G 732, G# 776. Obviously he's entitled to make up whatever series of integers he wants to, and to assign arbitrary meaning to them. It remains to be shown how this has anything to do with Bach, or any Baroque-era practices, or how these can be set up without the invention of electrical devices. Some other Sparschuh numerical inventions, from TUNING-L, for any who may be interested in such sui generis material: [5/20/06] [5/22/06] [5/26/06] [11/18/06] [3/02/07] [4/12/07] [4/13/07] [4/17/07] [4/25/07] [6/15/07] [10/09/07] None of it has any connections with historical methods, that I can see. It just looks to me like an ongoing game of juggling pages of numerals to invent temperaments...usually based on a premise of specific integer frequencies. See also the "November 2007" section and its follow-up, below. Dated April 17th 2006, Charles Francis has invented yet another "Bach" temperament and announced it on HPSCHD-L. This time the presentation is a self-generated PDF file claiming to be about Bach's seal insignia (1722), as an indicator of temperament. That is, it competes directly with Sparschuh's and Kellner's. This PDF file consists of little but a 55-item bibliography of Herbert Kellner's papers (none of which are cited directly for any of their content! ), plus several color pictures, two tables of cent values, and two graphs. Francis's newest proposed temperament has five pure 5ths F-Bb-Eb-Ab-C#-F#, and seven differently tempered 5ths (all the others). Those are forced variously to beat 1, 1/2, or 3/2 times per second, in one specific octave, and working out only at the pitch of A=415.882. But, the note A is tuned last in Francis's scheme, his "canonical tuning procedure within the small octave"! We have to start from F and/or all the flats and sharps, from some unspecified pitch source. Francis doesn't even say what the "small octave" is, for selecting the bearing region of the keyboard; we are just supposed to know it from reading his other papers...in which he borrowed somebody else's terminology from an internet reference, establishing an ersatz standard nomenclature that applies only to his own papers. The count of arbitrarily invented and "published" temperaments (i.e. distributed on the internet) by Charles Francis is over 150. One wonders why he has now abandoned his own 144 readings of the Bach WTC diagram--item #58 in his bibliography--in favor of this newest bit about the seal; but there is no explanation given. Only the sycophantic veneration of Kellner, while overruling Kellner's results (without explanation there either, but only a laconic pair of graphs plotting Francis/Sparschuh/Kellner layouts). As with the other results, this is the dealing of five-card draw poker with the declaration that all non-aces are wild. John O'Donnell's temperament and article for Early Music (printed November 2006) are discussed here. Mark Lindley's temperament and article for Early Music (printed November 2006) are discussed here. 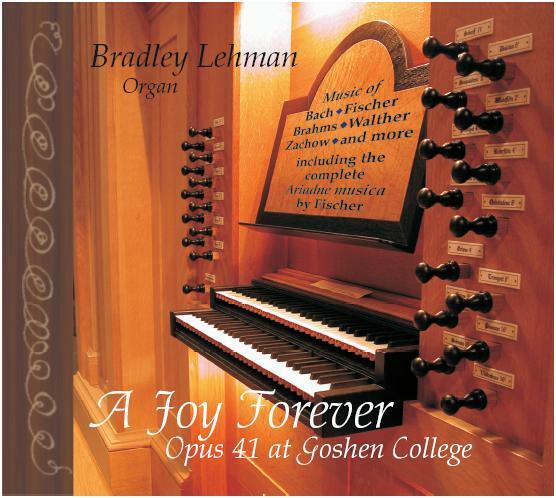 A second "Bach" temperament by me (Bradley Lehman), based on the same Bach drawing, has been available to the public since 8 March 2006. It is discussed in context on my page responding to O'Donnell's article, and at the practical instructions page. In the May 2007 issue of Clavichord International there is a stimulating new article by Miklos Spanyi, "Kirnberger's Temperament and its Use in Today's Musical Praxis" (dated 2006 at the end of the article). It presents Johann Philipp Kirnberger's temperament from his book Die Kunst des reinen Satzes, 1771-79, and provides a bit of historical background around it. "I have no scientific musicological argument to prove that Kirnberger's temperament corresponds with that of Bach's. Kirnberger himself did not assert this, either, though he declared his treatise to be a summary of Bach's teachings. I have come to the conclusion that the Kirnberger-Bach connection in matters of tuning could be conceivable. Kirnberger adored J. S. Bach, his music and his aesthetics with near-religious zeal, as did other representatives of the 'Bach-school'. It seems rather unconvincing to suppose that Kirnberger would have published a temperament in his book which totally contradicted the tempering praxis of his master. And would C. P. E. Bach have defended Kirnberger against Marpurg if the former had published a temperament contradicting the tuning praxis of his father?" Heavily tempered: D-A-E 5ths (equally rough quality, 1/2 comma each). Schisma: F#-Db resulting slightly narrow (not tuned directly). Spanyi, one of the world's finest clavichordists and also an excellent player of harpsichord and organ, has devised a way to tune an artful modification of Kirnberger's system. One should make the pure 5ths not absolutely pure, as Kirnberger prescribed, but rather some or all of them should be made imperceptibly narrowed. They should not be so narrow as to begin causing beats, but only enough that they create a cumulative improvement in major 3rds whenever we have had four of these "pure" 5ths/4ths in succession. I have set this up on my harpsichords, working from Spanyi's several sets of instructions in his article. Spanyi's technique of fudging the pure 5ths imperceptibly narrow does (sort of) work, although it takes a lot of extra time and it doesn't add up to any large improvement anyway. The step in his instructions that makes the most difference in the D-A-E 5ths is not all those nearly-pure 5ths around the back, but rather the deliberate placement of C-E wider than pure by "2 - 3 times a second". Spanyi's allowance of the narrower F#-C# 5th (instead of being as small as a schisma) also buys him some improvement in the E, B, and F# major triads by reducing the sizes of their major 3rds. Sure, it all sounds arguably "better" in result than setting Kirnberger 2 with Kirnberger's own mathematical correctness of 5ths/4ths and the C-E major 3rd...but all it accomplishes is to make the same basic problems more moderate without solving them. 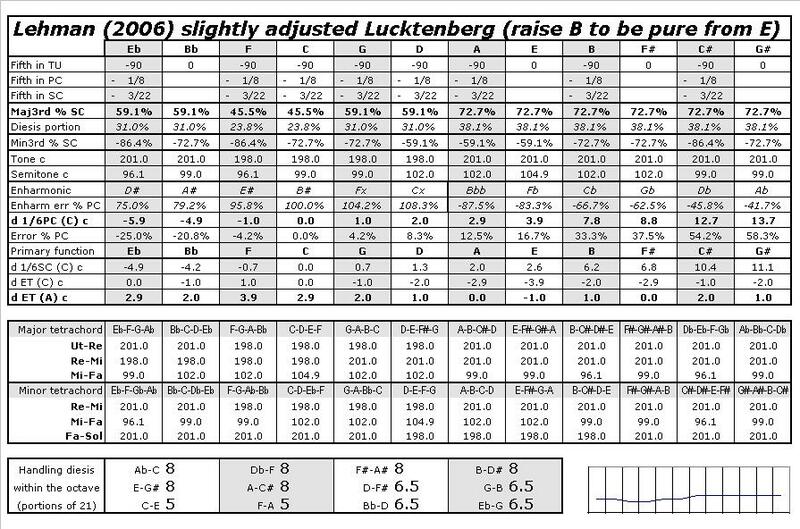 Kirnberger's own tables of exact ratios (reproduced in Spanyi's article as figures 3 to 5) makes it plain that Kirnberger expected at least an on-paper accuracy with the 5ths, not a scarcely-perceptible narrowing to cheat his system. Spanyi blames the problem of Pythagorean major 3rds on people who tune sloppily, or who rely too heavily on improperly programmed tuning machines. If they accidentally make some of the 5ths wider than pure by even one cent, this accumulates into major 3rds that become larger than 408 cents (the Pythagorean size). Well, sure, that's true...but these allegedly unskilled tuners could just as easily err on the other side, and so that argument is moot. People who can't hear or set their intervals carefully can't hear or set their intervals carefully; so what? Listening to an instrument tuned in this way, with or without Spanyi's careful modifications, one can perhaps become accustomed to the steady diet of Pythagorean or nearly-Pythagorean major 3rds everywhere...although it doesn't make the instrument sound either relaxed or pleasant. One can become accustomed to daily medications or prescribed diets, too, without the process ever becoming pleasurable or completely painless. "Kirnberger 2" has a distinctive sound, for what it is. "'Key characters' are clearly outlined: the alternation of the extremities in chord structures -- mostly pure on one and (mostly) Pythagorean triads on the other side as well as just a few triads between these extremes -- F major, D major and A major -- give much more personality to the different tonalities than the (partly inaudible) subtleties among the many sizes of the major thirds in most other 18th century 'well' temperaments. When modulating, we step very suddenly outside the circle of pure triads and enter the realm of the Pythagorean intervals: already the Bb-major chord is Pythagorean! While in other 'well' temperaments one often has the feeling that near keys with purer thirds are 'better' and remote ones with wider or Pythagorean thirds 'worse', in Kirnberger's temperament one does not experience the key differences hierarchically. There are no 'better' or 'worse' keys, only very strongly contrasting ones. When the tuning has been laid well, the rather heavily tempered fifths D-A and A-E do not disturb, either, and despite of their relatively fast beats they positively contribute to the warm and colourful sound of the chords in which they occur." Yes, strong contrasts. I hear it. Extremism. Yes, I hear it. It sounds unreasonable to me in the music. I've taken the liberty of playing not only Bach in this temperament, but also some Haydn, Mozart, and Beethoven. In my opinion, it just makes the instrument sound silly, with sudden contrasts among "dead" (unbeating) triads, violently buzzing triads, weird interim triads with the note A in them, and more complex situations of counterpoint or harmony. The simpler the musical texture is, the worse the music sounds! The music lurches randomly from seeming "in tune" to "way out of tune" and back, with no apparent purpose. I especially don't fancy hearing Pythagorean triads in otherwise warm/gentle music in E-flat and B-flat major. I also don't fancy the way this temperament treats melodic intervals, especially where the note A is involved. The bigger problem than the major 3rds, as Spanyi points out but rationalizes away (here and elsewhere), is the series of tight 5ths D-A-E. They simply can't be played except within full and closely-spaced harmonies! In open spacings, or in two- or three-voiced textures, they're naked and ugly. Bach's first prelude and fugue of the Well-Tempered Clavier, C major, already bring up the problem in an obvious way. Bars 2, 5, and 12 of the prelude put these roughly mistuned intervals of D-A and A-E through arpeggios, wide open. And in the fugue it's worse: for example, at the end of bar 11 there are a D-A-E all being struck together in three-voiced counterpoint. Playing through this whole fugue several times, I found nearly two dozen spots that call attention to themselves as blatantly raw, where the note A is played with D or E (or both). These cringe-worthy spots are in bars 2, 4, 5, 6, 7, 8, 9, 11, 12, 13, 16, 17, 19, 21, 25, 26, 27...right through the penultimate beat of the composition! Melodically, too, things sound lumpy whether an A is being played or not. To hear this, best: play it yourself on a harpsichord, having tuned it by ear to Kirnberger 2. Second best: hear it demonstrated in a YouTube video. Similar problems pop up in the D minor prelude and fugue, and the G minor fugue, among others. The counterpoint brings that horribly mis-tuned A into situations where there is no compelling reason it should sound sour; it makes the temperament sound incompetent, no matter how carefully it has been set. As a candidate to play the Well-Tempered Clavier, this Kirnberger temperament fails immediately. If Kirnberger ever demonstrated any of these compositions for fellow musicians who could hear, it would have had to be on a clavichord or (perhaps) a fortepiano that were especially forgiving of intonational problems. On harpsichord, "it's right out." The euphony between the cringing moments is certainly attractive, but why should the music sound randomly ugly like this? Spanyi doesn't say anything about using this temperament with string players, either. Would they tolerate the 1/2 comma (or nearly 1/2 comma, in Spanyi's version) narrowing of D-A-E? 5ths tempered this tightly sound even worse on violins than they do on harpsichords. If any musicians around either Kirnberger or Bach actually used this system, with a keyboard and strings together, might somebody not have complained about it in an extant document at least once? "13. Among the recent reconstructions of bach's possible temperament, I find especially that suggested by Bradley Lehmann, published in Early Music (February and May 2005) and in Clavichord International (November 2005) very unsatisfactory. I am completely aware of the subjective character of these remarks. Lehmann's temperament gives me the uneasy feeling of having a seat in economy class on a long intercontinental flight beside a very fat person, resulting in an uncomfortable sitting position during the whole flight." As of November 2007, Sparschuh (see above) has now retracted his beat-counting schemes from the Bach drawing. Now, in several postings to TUNING-L [Nov 25] [Nov 27], he is reinterpreting this Bach drawing somehow (how?) as an endorsement of Werckmeister's most famous scheme: the one that has C-G-D-A tempered, A-E-B pure, B-F# tempered, and all of Gb-Db-Ab-Eb-Bb-F-C pure. Again, how? If he's taking C-G-D-A as the first intervals from the left here, fine...but then where's the B-F#, and why don't the Gb-Db-Ab-Eb-Bb-F-C look like the A-E-B since they're all allegedly pure? 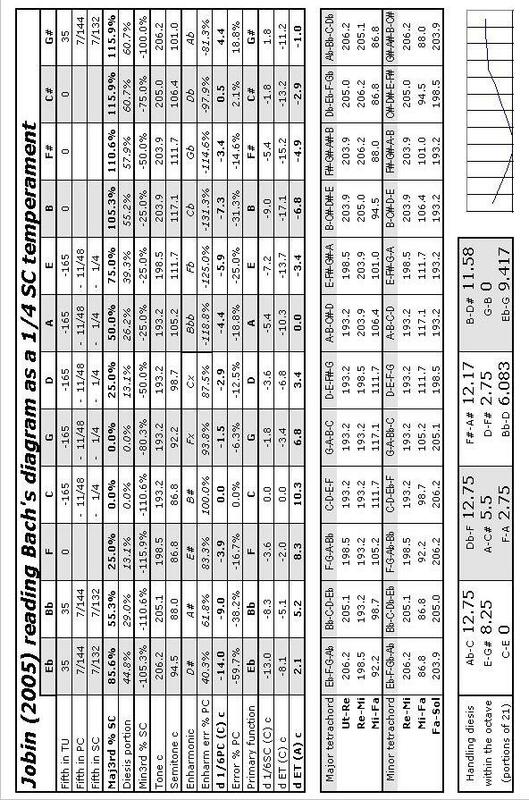 c 283.5 = 567/2 "middle_C"
Sparschuh's calculations here have logarithms (ln()...) in each of the four tempering steps. Is it expected that any 18th century musicians would have done it that way, too? A page of calculations, with or without logarithms, before they could sit down at a harpsichord to try to tune it? To compound the problem, he's taking Werckmeister's text as indicating not a normal split of the PC into four equal pieces (one each at C-G, G-D, D-A, and B-F#), but rather as an irregular system loosely based on 2/7 SC for each of C-G-D-A, and with B-F# being whatever is left over. And, the C-G-D-A are only being approximated (once again with Sparschuh's pet notion of integer frequencies...567, 1695, 5067, 45441, 136323...the last two of those being higher than the threshold of human hearing...) using ratios of integers, instead of with geometrically equal splits of the syntonic comma. 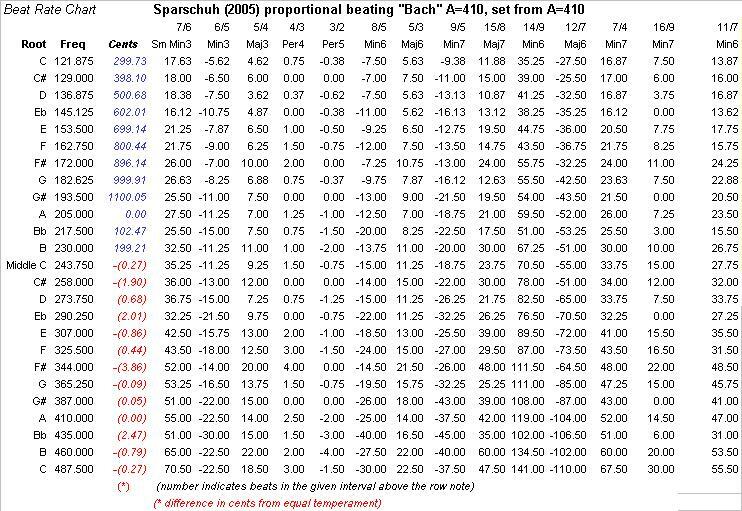 Sparschuh apparently still can't take the notion that practical tuning was ever a listening process foremost, rather than a bunch of calculations with logarithms or ratios.... For him, everything has to be calculated down to the least significant digits! It's not convincing to me that even Werckmeister would have recognized or approved this process. It all calls for a numerical precision, and a method of measuring things, that simply isn't possible on real harpsichords or organs. Especially not on organs (and Werckmeister's main topic was pipe organs! ): some of the flue pipes playing alone will have a pitch that wobbles as much as several cents around some central point. That is as steady as they get, with the normal chaotic behavior of air through the mouth of a whistle. How is it expected that Sparschuh's calculations of 1/10th of a cent, or to the thousandth and millionth, would be meaningful in trying to tune an organ pipe? Why would such a laborious process of calculation matter even the slightest bit to any practical musician of the 18th century? Why would Bach, working on harpsichords, limit himself to any published temperament at all...let alone one designed for organ conversions instead of harpsichords? What about the notorious report (in Forkel's biography) that no one else could tune to Bach's satisfaction? Any reasonably competent harpsichord tuner can slam this Werckmeister layout onto a harpsichord in 10-20 minutes...especially so if they need to maintain one or more harpsichords year-round, tuning from scratch (or at least doing touch-ups) more than 100 times in a year. It's that easy, and this temperament is that brutally unsubtle. If Bach favored this particular layout, what's the meaning of the report that he was never satisfied? Isn't that an argument that Bach preferred some different scheme that any Werckmeister disciples wouldn't know how to do? A scheme that sounds better than this, playing Bach's music? This Werckmeister layout brings up hundreds of (arguably) ugly spots when playing through this very book, the "Well-Tempered Clavier" (book 1). It can't handle the music in keys as simple as two or more sharps (B minor, F# minor, A major with the E#s that come up...), or more than two flats. Why then would Bach write an entire book of examples through all 24 keys, to promote a keyboard-tuning scheme that makes his music sound unimpressive and ugly? At around the same time, the early 1720s, Bach was also writing the C minor and B minor "French" suites...which also sound (arguably) hideous in this Werckmeister layout. There are obvious problems in many of the enharmonically-respelled notes (such as A#, E#, B#, Db, Gb, and Cb), and in the 5ths C-G, G-D, and D-A when they're played as open 12ths (or 19ths) in two-voiced texture...which happens frequently in those suites, and in Bach's fugues. If some scholarly or pseudo-scholarly case is being made for this tuning system, doesn't it necessarily imply that Bach therefore had tin ears, and/or just didn't care about beauty on his harpsichords and clavichords? What is supposed to be done with Bach's other music that is considerably earlier or later than 1722? If Bach favored any Werckmeister scheme straight out of a book, why didn't he say so directly? Sparschuh's numerical games on TUNING-L have continued: [3/28/08] [4/09/08] [4/18/08] [4/09/08] [4/23/08] [4/24/08] [4/25/08] [4/25/08] [5/02/08] [5/16/08] Perhaps someone can find some musical meaning in there somewhere? I can't see anything beyond his inventiveness with tables of frequencies and/or ratios. What does this have to do with playing any music, or discerning any historically plausible methodology? At least in that 6/27 posting Sparschuh was able to state his own numerical algorithms sufficiently clearly. It also explains why any temperaments with any wide 5ths (even barely-perceptibly wide, 704 cents) are anathema to his way of reckoning. They don't fit into Sparschuh's own type of numerical calculations neatly, and therefore Bach couldn't possibly have ever used or preferred such a thing! At that point, the discussion on "Yahoo! Clavichord" dissolved into nothing further than the following string of postings by Sparschuh, taking his usual swings against everything...and distancing himself from the possibility that any of my work could have any merit: [Sparschuh 7/09] [Sparschuh 7/09] [Sparschuh 7/09] [Sparschuh 7/09] [Sparschuh 7/09] As he said clearly in that last one, Bach's drawing is to Sparschuh a dead end; and Sparschuh continues to belittle everyone who takes it as serious evidence, in any way. Part of that posting: "Forget about any wild speculations about the 'squiggels': Meanwhile i do consider all interpretations -as far as i do know them- as barely 'wishful-thinking'? wihout any resonable justification." 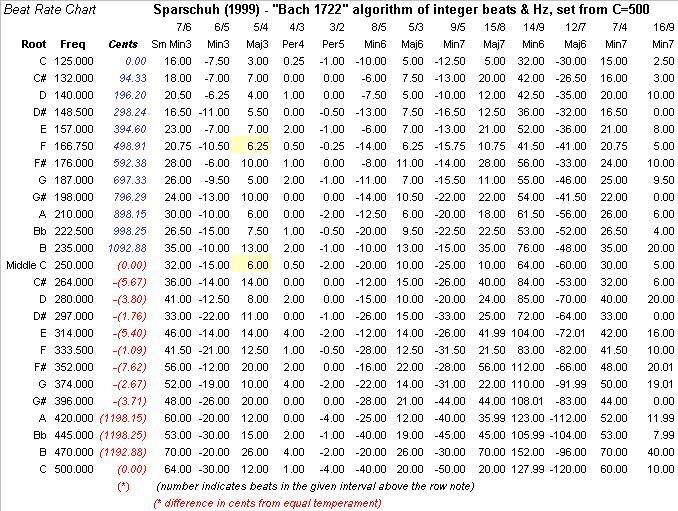 October 6, 2008 Sparschuh has made up yet another one and posted it to TUNING-L. Again, it has all its frequencies as integers (as if that's important, and somehow possible for Bach to have measured?). Here they are: c'243, c#'256, d'272 d#'288, e'304, f'324, f#'342, g'364, g#'384, a'406, a#'432, b'456, c"486. Allegedly it has something to do with Bach's Mietke harpsichord, and the WTC's title page's drawing. [Sparschuh 10/06] What happened to his own proclamation from July 9th? "Forget about any wild speculations about the 'squiggels': Meanwhile i do consider all interpretations -as far as i do know them- as barely 'wishful-thinking'? wihout any resonable justification." Evidently, Sparschuh is back on "the squiggels" again! If the '48' was written as a set of instruction pieces for the young musician learning about temperament (this is the old chestnut about the well-tempered clavier) then some crucial things are not made clear to him: chiefly, what exactly does 'well-tempered' mean (recently interpreted evidence suggests that it meant 'equal temperament' after all), how is he to tune by it, and what precisely do the pieces demonstrate about the 24 keys other than how to get your fingers around them? "Keys that can never sound really well unless individually tuned...": Williams has returned to this speculative idea in his newest book, J. S. Bach: A Life in Music (Cambridge, 2007), page 336. Behind many arguments is a ruling assumption: that a single tuning was intended and that each book is a set or cycle of pieces to be played as such in the given order, and that its very title is evidence for this. Recognizing the oddity of pieces rising by semitones, some interpreters change to a more reasoned order, for instance by dominants. But today's habit of playing 'complete works' in concerts is not relevant to a group of pieces assembled for reasons best known to an habitual collector -- reasons including the teaching of young players and composers in all the keys. For all one knows to the contrary, the intention in the Well-tempered Clavier could have been for the player to tune for each key as it was studied, something not requiring great skill. That no individual piece in WTC modulates very far means that no key needs to be tuned except for the piece concerned, even if theorists, who have no thought of playing all twenty-four in sequence, do not say so. The very order -- major, minor, then up by a semitone -- is not musically logical, nor does it make a true cycle, more a filling-in of the partial orders already familiar to composers, whose sets of pieces likewise were not cycles. Bach accepted him with particular kindness because he came from Schwarzburg, and always thereafter called him Landsmann. He promised to give him the instruction he desired and asked at once whether he had industriously played fugues. At the first lesson he set the Inventions before him. When he had studied these through to Bach's satisfaction, there followed a series of suites, then The Well-Tempered Clavier. This latter work Bach played altogether three times through for him with his unmatchable art, and my father counted these among his happiest hours, when Bach, under the pretext of not feeling in the mood to teach, sat himself at one of his fine instruments and thus turned these hours into minutes. The conclusion of the instruction was thorough bass, for which Bach chose the Albinoni violin solos; and I must admit that I have never heard anything better than the style in which my father executed these basses according to Bach's fashion, particularly in the singing of the voices. This accompaniment was in itself so beautiful that no principal voice could have added to the pleasure it gave me. Did Bach stop and retune his harpsichord from piece to piece, or resequence the pieces into some scheme other than rising semitones, in these play-through sessions? (If Bach stopped at any point to retune to a different selection of notes, why didn't Gerber say so?) Did Bach perhaps use a fretted clavichord, where it is impossible to reorganize a temperament without bending the tangents? And what is behind Williams's assertions that the student should merely learn to tune each key (scale) appropriately as it comes up in the lesson? How is this to be done? Williams doesn't say, although he asserts that the process is "something not requiring great skill". The skill at least requires one to look ahead through the whole piece, determining which notes are required, doesn't it? Assume for the moment that Williams's scheme of retuning per composition is the plan. Does a retuning plan hold up, when faced with the music that is actually in the book? Or, does it still require us to forgive moments where the notes are still noticeably out of tune for their spelling? I presume that Williams was referring to regular systems, where eleven 5ths are all tuned similarly (each a bit narrow), and there is one leftover wolf. Major 3rds are made more nearly consonant (i.e. smaller, and closer to 5:4 ratio) than they are in equal temperament. The four diminished 4ths are much wider than the eight correctly-spelled major 3rds. Twelve notes are selected, according to the occurrence of their spelling within the music. For example, the C major scale uses the C-D-E-F-G-A-B plus the most closely related accidentals, F#-C#-G# and Bb-Eb. In sequence by 5ths, as tuning is done, that is a line such as Eb-Bb-F-C-G-D-A-E-B-F#-C#-G#, starting at any convenient point among the naturals and working outward in both directions. If a piece happens to need some different note, such as an Ab instead of a G#, that note is retuned to the correct spelling (flats are higher than sharps)...or some compromise is made, placing the pitch at some intermediate position between flat and sharp so it can serve roughly as either one, altering the regularity of the system. Such irregularity is OK, and is "ordinary" practice, but how is it to be done for a piece such as the C# major prelude? It needs 14 different notes: A-E-B-F#-C#-G#-D#-A#-E#-B#-Fx-Cx-Gx-Dx. If the tuner favors A and E, the Gx and Dx are going to sound too high for their contexts. And conversely, if he favors the Gx and Dx (why would he ever do that? ), the A and E will be too low. When we continue into the fugue, we notice that it uses a 15th note: Ax. Should we favor it as a B, or as an Ax? If we start moving all these notes around, soon we are left with no unaltered naturals! Williams's assertion is disingenuous at best: "That no individual piece in WTC modulates very far means that no key needs to be tuned except for the piece concerned...." Many individual pieces in WTC do modulate to use 13, 14, or 15 notes within the same short composition. (So do many of the two-part and three-part inventions, and I have already addressed that issue in print. That book of inventions uses 24 different notes! Is one to retune the instrument all over the place to play that book?) Even the first prelude and fugue in the WTC present this practical problem: the prelude needs Ab and the fugue needs G#. Where is the tuning student to put that note, within Williams's strategy? The B minor fugue needs 13 different notes already in the first statement of its subject: C-G-D-A-E-B-F#-C#-G#-D#-A#-E#-B#. Where is that B#/C to be placed so it appropriately serves its melodic and harmonic functions? A 14th note, F, comes into the answer as early as bar 5. How should the E#/F be tuned? Bb, Eb, and Fx occur later within this same fugue, and now we are up to 17 notes. How should they be tuned, and what happens to "no individual piece in WTC modulates very far"? Do we have a split-key instrument where the front half plays G natural and the back half plays Fx? 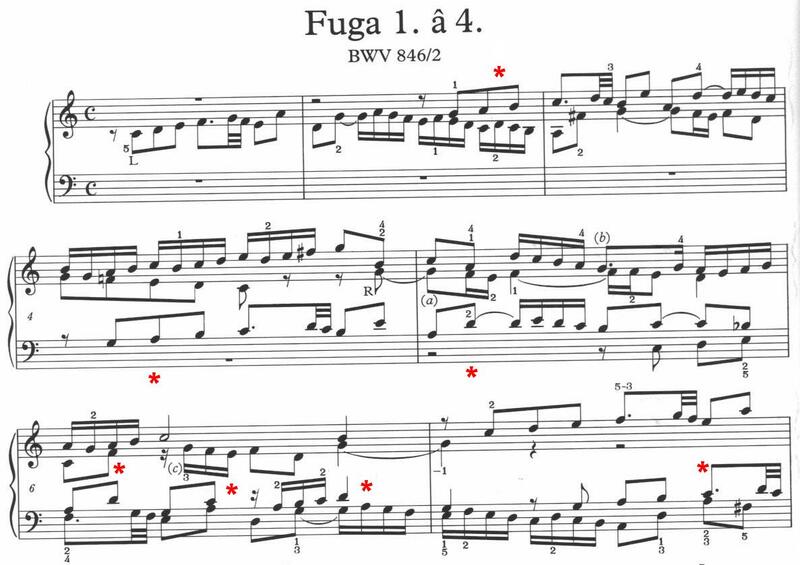 If we need 17 differently-spelled notes for a single fugue, why not just assume that Bach did have a good-sounding scheme to set up the keyboard once, and leave it that way for the whole book? As my papers propose, one need only put the F-C-G-D-A-E into their normal and regular 1/6 comma positions, and then place the other six notes B-F#-C#-G#-D#-A# into tastefully compromised positions according to Bach's drawing (making their 5ths less tempered than the naturals' 1/6 comma had had). Having done so, we can play as far as we want to into the double-flats, flats, naturals, sharps, and double-sharps...without ever encountering a need to retune anything. This is "something not requiring great skill" if we simply follow Bach's instructions, as provided in his musical examples of this book, plus its title page drawing indicating the correct alterations. Another draft of my response here is in this discussion-board posting. Incidentally, that requirement of 13 or more notes within the same composition also comes up within Johann Kuhnau's published keyboard music, 1689-1700, in Leipzig. Kuhnau would have needed some type of circulating temperament, too, since it doesn't work to retune regular meantone layouts per composition going beyond 12 notes. See the discussion on my "Temperament-killer Tests" page. I have two YouTube videos that broach this retuning approach. Part 1 presents recorded samples from all of WTC book 1 in spiral-of-5ths sequence, and Part 2 in chromatic sequence. These videos present the complete roster of pitch classes (note names) needed by each prelude and fugue. "The question asked of each prelude/fugue is: IF we were try to retune the instrument per composition, exactly which notes are required in each one, and where should they be? And, what happens when the composition asks for two differently-spelled notes sharing the same key lever, such as D# and Eb? (...) There are only a few preludes/fugues in the book that stay within 12 notes. Most use 13, 14, or 15 with these enharmonic overlaps. On a standard 12-key-per-octave keyboard, tuning compromises MUST be made to handle these dual-function notes. That is a major point of my research. The music itself constrains any proposed temperament to a small range of compromises in which this enharmonic swapping works passably, playing these compositions that go beyond 12 notes. " The pitch-class roster is also on my page about other test pieces. Finally, in this section about Williams's argumentation, I have to wonder: did he actually read all of that paper of mine before reacting to it? His 2007 book's bibliography cites only the first printed section, the first 20 pages printed in February 2005. And, his argument treats my work as if it's nothing but graphology...which (seriously mistaken!) impression one might indeed get, if reading only the first 20 pages of the piece and then stopping. What about the printed part 2 that May, and the five web-only files (PDF), and the listening examples that are all vital parts of that same article? Harrumph. Bernhard Billeter's article "Zur 'Wohltemperirten' Stimmung von Johann Sebastian Bach: Wie hat Bach seine Cembali gestimmt?" appears in the March 2008 issue of Ars Organi, pp 18-21. It addresses some of the argument in the printed portions (only!) of my main 2005 article. It then presents a table of cent values for five temperaments. The first two are Billeter's own modifications of "Kirnberger III". As Billeter notes here in the article, this Kirnberger temperament is only from a private letter in 1779, and was not published until 1871. Billeter gently trims it down so the second column's temperament doesn't have any Pythagorean major 3rds anymore. 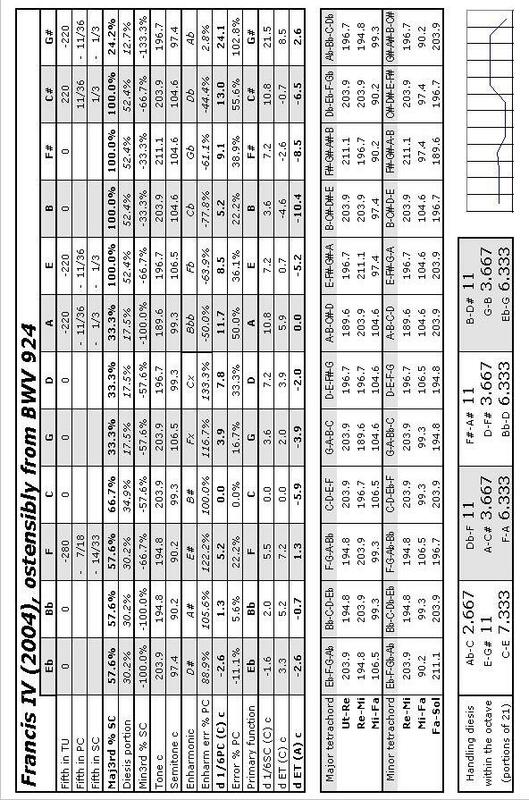 The third column of the table presents the layout from my 2005 "Rosetta Stone" article...giving the cent values to an unnecessary precision of three decimal places, and making the whole thing look like merely a numbers game. The fourth and fifth columns then give Billeter's suggested improvements to that. First, he puts more tempering into A-E and less into F-C, gets rid of my slightly wide Bb-F, and lightens the already tiny tempering of Ab-Eb-Bb to be only one cent each (instead of two). These seemingly innocuous adjustments actually move eight of the twelve notes to different positions, keeping only C-G-D-A in place! Then, Billeter rotates the entire circle upward by a 5th, such that Ab-C becomes wider than E-G#, and the smallest major 3rd anywhere becomes G-B instead of C-E. By this point, relative to C, Billeter has moved all eleven other notes and has changed the temperament's harmonic character, too...even though it looks like barely-noticeable changes, working with cent values on paper. Billeter's temperaments here are presented without any direct musical justification. They're fine in isolation, but how do they interact with any of Bach's music? They aren't given any historical justification, either, except for Billeter's own unwillingness to accept any Bach-styled temperaments that have any allegedly "French" wide 5ths in them. Billeter has apparently missed my presentation of an Italian 17th century temperament that also has wide 5ths, in that same article, since it appears only in the web portions...not in the printed sections! He also ignores the substantial handful of Neidhardt's published temperaments from 1732 that have wide 5ths in them. In offering two alleged improvements to my layout, Billeter drifts away from the fact that in Bach's drawing the loops are clearly the same as one another...where Billeter adjusts some of them to more "favorable values" (günstigeren Werten), changing the 5ths into dissimilar sizes. He presses the sound toward a similarity with his own modifications of Kirnberger III, for whatever that might tell us about Bach's practice(s). 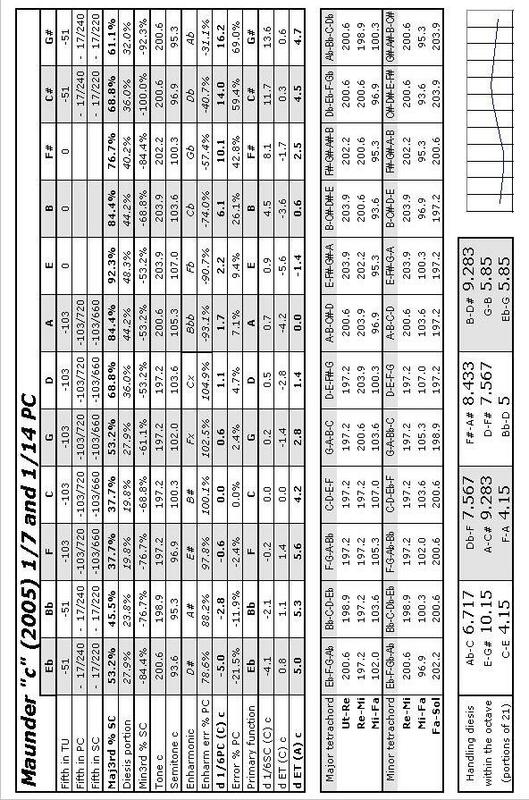 Eb-G 8.25, G-B 2.75, B-D# 10. 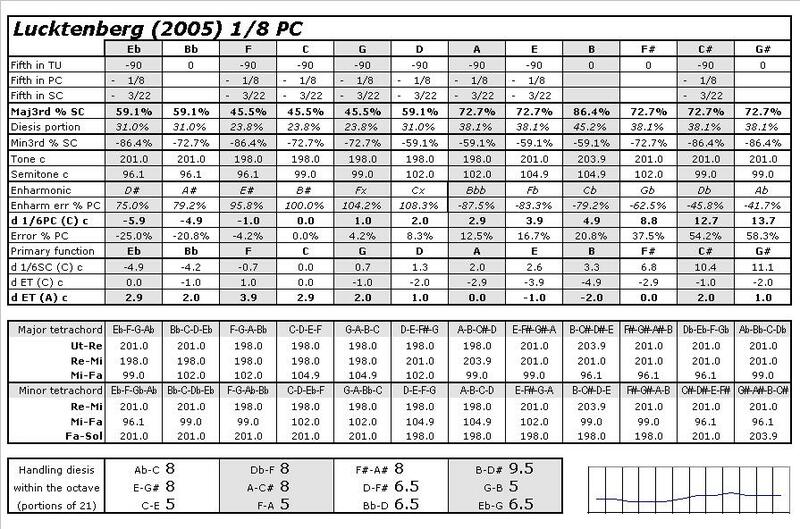 So...Billeter's 2008 preference has basically the same harmonic shape that he liked all the way back in 1979, and it has only become a bit milder in its contrasts. The 1979 temperament most closely resembled Kirnberger II, the one with the two tight 5ths in D-A-E. The 2008 rotation here is apparently loosely based on Kirnberger III and Bach's drawing, finessed together until they give the expected balance that Billeter likes. All the major 3rds are now smaller than the Pythagorean size (11), while each set of three major 3rds has the same relative relationships as before. If we look at this even more closely, we see that the relative balance within each set of three goes all the way back to the shape of Werckmeister III, in 1681...or beyond it, to the balances of unmodified meantone layouts. Are we dealing with ingrained habits and expectations that are that unbreakable? Why would Bach have expected such a balance? And, what about my demonstrations in my paper that show why that Werckmeister harmonic shape does not work for Bach's music? Anyone is free to make whatever musical adjustments sound good to their own expectations. However, my own point has been to put forth what I see from Bach's music and Bach's drawing as a historically likely method...no matter how anyone today might want to slide things around by several cents, or transpose the whole thing. I can't resist the chutzpah of Wanda Landowska's famous quote to another musician, about playing Bach's music: "You do things your way; I'll do it his way." Eb-G 7, G-B 5, B-D# 9. 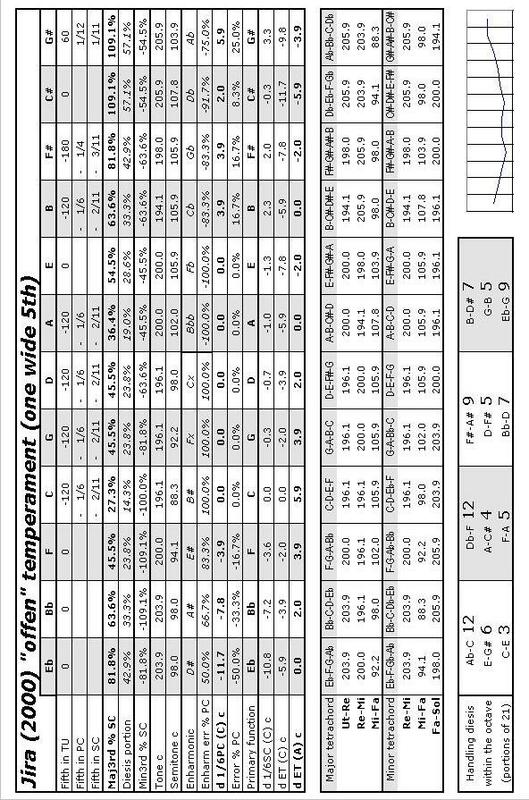 ...That is, most of the major 3rds involving sharps are wider than those involving flats. This is the big paradigm shift that I believe is present in both Bach's music and his drawing: that treatment of flats as milder dissonances than sharps. Such a balance allows Bach's music to sound "better" overall, with the musical tensions and the intonation matching one another closely. That's my point, challenging the musicological and musical communities. But Billeter's 2008 article, here, just presses us back into the old Werckmeisterish direction again. No paradigm shift is allowed. I am preparing a more extensive response to the article, adding further to these comments. In the e-book Unequal Temperaments: Theory, History and Practice (2008-9), Claudio Di Veroli resuscitates the Barnes experiment to derive several new "Bach" temperaments for the WTC: "WTC Optimal" and "WTC Optimal+". My full review of these is in the December 2009 issue of the Viola da Gamba Society Journal. The direct link is here: the article starts on page 25 of that PDF file, or page 137 of the journal's numbering. Set middle d' at 1 beat/sec from each of these, working from d'-a' as a 5th, and a-d' as a 4th. This sets the 1/12th comma tempering of that 5th, and incidentally checks the octave. Set f below a at 4 beats per second (or only 3.75 if working from an A=415 fork). 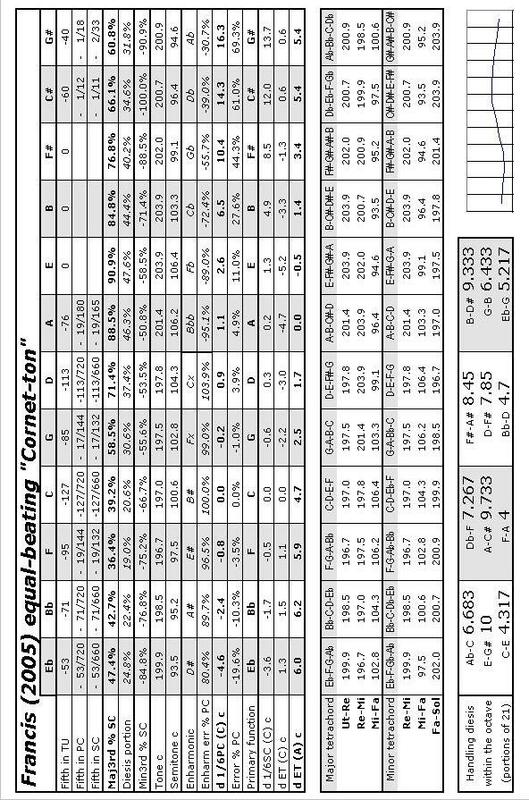 Check that the minor 6th f-d' is about 5 per second. Pure octave f' from f.
Place c' and g so all the F-C-G-D are similar (1/6 comma each). From a, place e' as a similar 1/6 comma 5th. Copy e' down to e as a pure octave. From e' and e, place b, similarly 1/6 comma. (It will be moved slightly later.) The 5th e-b has the same quality as the f-c' next to it. From b, tune pure all of B-F#-C#-G#-D#-Bb. Check that the bb-f' 5th and the f-bb 4th have worked out to be very lightly tempered, only 1/12th comma each. If this is not right, go back to the previous step and redo the series of pure 5ths/4ths. Nudge b slightly higher, so it is of average quality between b-f# and e-b (and check the b-e' 4th, also). All of those are 1/12th comma, with a gentle wavering. If "Optimal+", there is one final step: nudge g# slightly higher until the g#-d#' 5th and the g#-c#' 4th each begin to beat, barely noticeably. This is making the g#-d#' 5th 1/12th comma narrow, and g#-c#' 1/12th comma wide. Finish the instrument by octaves and unisons. 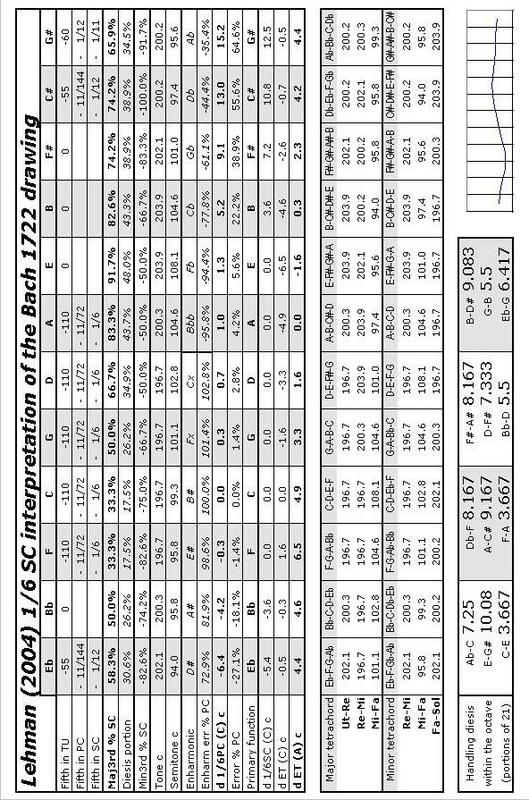 To compare any of these "Bach" temperaments (old or new) against my main proposed layout [Practical instructions], the charts are at the mathematical analysis page. A suggested list of Bach repertoire to test these, giving them a play-through to hear how they sound in practice, is here. And why not simply use equal temperament? This is addressed at the FAQ page and the Affekt page. By all means, play the repertoire in equal temperament as part of the comparison, with sensitive listeners to gauge if the music holds their attention!